For once there is an Irish Public Sector “social media” encounter that might just work. An Garda Síochána have a Flickr account that provides function as well as fluff. The first thing that strikes me is that person looking after the account knows what they are doing. There are no IMG00234.jpg titles and they have the photos neatly organised in sets. Their lost and found photosets are divided in two, one for bicycles, and one for other lost property. 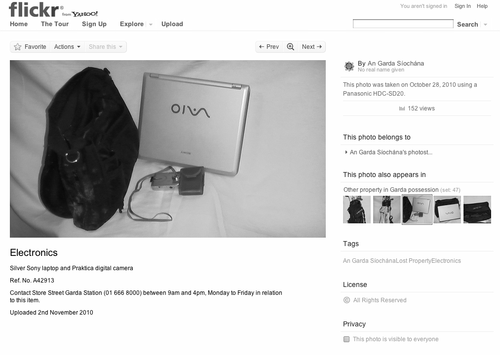 Each item is clearly photographed, with a reference, and contact information for the Garda Station where the item is located. Who knows if this will scale well country wide, but it’s a good place to start.